Last year we played on Boxing Day and were received by a surprisingly large audience. This time we had twelve days to go before Christmas, so it was a chance to put everyone in a festive mood. The audience this time consisted of¬†hundreds¬†of¬†people, many of whom were tourists from all around the globe (I spoke with people from Germany, South Africa and the U.S.A). We played 12 Christmas Carol arrangements all in all, with approximately half coming from our first CD, entitled ‘I Saw Three Ships and other carols’ and the other half from our second disc ‘It Came Upon the Midnight Clear and other carols’. All the carols were announced, with a brief history of each and I was fortunate in that I was handed a wonderful, multi directional microphone before we went on (last year I did the announcements unaided and found projecting to the back of the church a real challenge!). The combination of wonderful playing acoustics, architectural splendours, enthusiastic audience members and Christmas music was a magical one and everyone seemed to leave with a spring in their step! 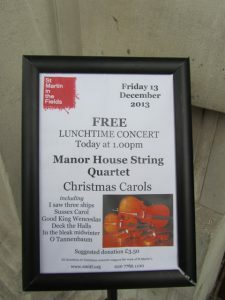 We hope to be able to return to St Martin’s again next year as this was a highlight in the quartet’s December schedule.